This is taken from Exodus 32:1-14: When the people saw that Moses delayed to come down from the mountain, the people gathered around Aaron, and said to him, “Come, make gods for us, who shall go before us; as for this Moses, the man who brought us up out of the land of Egypt, we do not know what has become of him.” Aaron said to them, “Take off the gold rings that are on the ears of your wives, your sons, and your daughters, and bring them to me.” So all the people took off the gold rings from their ears and brought them to Aaron. He took the gold from them, formed it in a mould,[a] and cast an image of a calf; and they said, “These are your gods, O Israel, who brought you up out of the land of Egypt!” When Aaron saw this, he built an altar before it; and Aaron made a proclamation and said, “Tomorrow shall be a festival to the Lord.” They rose early the next day, and offered burnt offerings and brought sacrifices of well-being, and the people sat down to eat and drink and rose up to revel. The Lord said to Moses, “Go down at once! Your people, whom you brought up out of the land of Egypt, have acted perversely; they have been quick to turn aside from the way that I commanded them; they have cast for themselves an image of a calf, and have worshiped it and sacrificed to it, and said, ‘These are your gods, O Israel, who brought you up out of the land of Egypt!’” The Lord said to Moses, “I have seen this person, how stiff-necked they are. Now let me alone, so that my wrath may burn hot against them and I may consume them, and of you, I will make a great nation.” But Moses implored the Lord his God, and said, “O Lord, why does your wrath burn hot against your people, whom you brought out of the land of Egypt with great power and with a mighty hand? Why should the Egyptians say, ‘It was with evil intent that he brought them out to kill them in the mountains, and to consume them from the face of the earth’? Turn from your fierce wrath; change your mind and do not bring disaster on your people. Remember Abraham, Isaac, and Israel, your servants, how you swore to them by your own self, saying to them, ‘I will multiply your descendants like the stars of heaven, and all this land that I have promised I will give to your descendants, and they shall inherit it forever.’” And the Lord changed his mind about the disaster that he planned to bring on his people. This is the word of the Lord. What is the Golden Calf? This passage, at first I had a problem because the passage we read today has a very foreign concept to all of us, a golden calf. We don’t make golden calves anymore. We don’t make idols with a golden calf anymore. We are too sophisticated, I mean, they’re still idols. I’m sure they’re still idols, but we don’t make a golden calf and say that is my God. I haven’t seen anyone who makes a golden calf and believes that it is their God, but the Israelites believed that this golden calf would lead them out of their miserable life and this is what they say. “And they said, these are your gods, O Israel, who brought you up out of the land of Egypt.” Strange, isn’t it? Look at the passage very carefully. Don’t you find this strange? The golden calf wasn’t there when they came out of Egypt, but they believed that the golden calf brought them up out of Egypt. That’s very strange to me. It doesn’t make sense, but they believed it anyway and I realize big belief is quite powerful and you want to believe something doesn’t matter whether it makes sense or not. Once you decide to believe you will just believe it. We can even rewrite history and some people call it alternative facts. That was what the golden calf did for them. The golden calf made them believe that he brought them out of Egypt. The power of the golden calf. 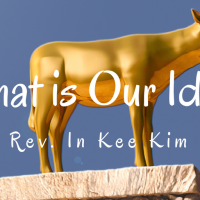 What is the golden calf to us? I think it is me. That’s what the golden calf is, narcissism, self-centeredness. Even then, the golden calf was not their idol and they knew it. The Israelites knew it very well. The golden calf was just a materialization of what was in their heart. They didn’t believe in the golden calf. They believed in themselves. The real idols were themselves. The golden calf was just a visible sign of what was in their heart. What did the golden calf do for them? It didn’t do anything. It didn’t give manna, it didn’t give them protection from the enemies and healing, but it gave them fantasy, comfort, a sense of peace. It made their make belief, real. When they saw the golden calf, they kind of felt better. They felt that everything will be all right from now as long as we have this golden calf, but it was only a fantasy in their own minds. Yes, the golden calf gave them fantasy in the wilderness, and they needed it. It gave them a false hope. Don’t we have a fantasy about ourselves? We think we can control our own destiny. We think we have so much power to create our own path. Who brought ourselves to the brink of total destruction? We are the ones who created the nuclear weapons, and yet we say to ourselves, we can bring all the good on our own. We created this kind of disaster, monster, that can eradicate humanity, all the people, and yet we say to ourselves, we can create our own path, we have enough power to make our life better. Do we really make our lives better? We depend absolutely on ourselves. That’s the only thing that we know we only depend on ourselves. That’s why when we do everything well, we feel like our lives would be alright and there’s a promising future. When my life is going well, we feel like our lives would be great in the future. When we are capable and smart enough to handle our problems, we feel that we can handle almost anything well, but when we are not doing very well and when we feel our powerlessness and when we cannot handle our problems with our brain, we get deeply discouraged and depressed because everything depends on me. Every single thing depends on me and my future depends on me. Happiness depends on me. That’s why we live with this eternal anxiety. What if I can’t? Simon sent to parents an article about the anxiety of the youth. Anxieties not just for the adults. Even the young children, they have anxiety problems because everything depends on me. The world taught them to believe themselves and that only created anxiety. The world taught you that you’re on your own, so take care of yourself. You’re on your own. Nobody’s there to help you. You’re on your own. Take care of yourself. That’s a fantasy. I’m not on my own, my parents helped me, my friends are helping me, my communities, helping me and I have God who cares for me. We are continuously creating this kind of fantasy that we are on our own and we can take care of ourselves and that gives us only anxiety, narcissism and self-centeredness. That is our golden calf. I think that is so prevalent in our lives, it consumes us. Sometimes we feel like we have all the world in our hands, but soon we feel like we are thrown into the bottom of the darkness. When they said that the golden calf will lead them from now on, what you’re really saying was we will dictate from now on our own destiny. Moses, I don’t know where he is and God, I don’t know where He is. I’ll take care of my own destiny and future. The golden calf was a very good tool to hypnotize themselves with their own positive beliefs. We say to ourselves, “Hey, I have money now. I can take care of my family and myself.” Didn’t you just say to the rich before who thought that I have enough food in my bar so let’s marry and enjoy my life. Jesus said, “your soul will be demanded tonight.” The golden calf cannot make their future. The golden calf cannot make a way for them. My friends, we ourselves cannot create our own path for the future. I believe that God made a way in the wilderness and rivers in the desert. This is what Isaiah said, “I’m about to do a new thing. Now it springs forth. Do you not perceive it? I’ll make a way in the wilderness and rivers in the desert. I cannot keep myself. It is God who keeps me.” One of my favourite psalms is Psalm 121 and I told KSM members to let us memorize this and maybe ESM too. Memorize this. Let us try to memorize Psalm 121 that is beautiful psalm it goes like this. “I lift up my eyes to the hills from where all my help come. My help comes from the Lord who made heaven and earth. He will not let your food be moved. He who keeps you will not slumber. He who keeps Israel, will neither slumber nor sleep. The Lord is your keeper. The Lord is your shade at your right hand. The Sun shall not strike you by day, nor the moon by the night. The Lord will keep you from all evil. He will keep your life. The Lord will keep your going out and you’re coming in from this time on and forevermore.” Isn’t it beautiful, Huh? No feeling so not even beautiful. Oh my goodness, it’s a beautiful psalm. So it’s constantly talking about keeping you. I don’t keep myself. It is God who keeps us. It is God who holds the key to your future. It is not you. You don’t have to worry about it just because things do not go well. Don’t be too discouraged. Your future doesn’t depend on you alone. Your God is right there with you. Don’t try to solve your life problems on your own. Trust in God. We have to destroy the idols of narcissism or individuality within us. It’s a fantasy. This world taught you. I can take care of myself. That’s a fantasy to me. When these idols take control of our lives, our lives will not get untangled. Sometimes these days. I mean, I told you, every morning I get up, read New York Times, Washington Times and Globe and Mail, and it’s for two hours I try to read what is going on in the world and I say to myself, we human beings cannot take care of humanity by ourselves. I feel helpless and hopeless many, many times, but I will move on. I’ll continue because I believe that there is God who takes care of the history, who sets a path for our destiny. I asked you a question last week. Do you untangle your life or is your life untangled? When I look back, so many things, they were not in my control and I don’t know how these things were untangled over the years. I’m just thankful to God for taking care of my life and my family and my community. God will be with you on your journey. Trusting God and a new path will be opened up for all of us.